This is Chinese spag bog sauce Taiwanese style. The flavour is similar to this chunky style recipe. Cheap, flavourful and very versatile, this sauce is great with plain rice, any noodles (dry or soup), stir fries vegetables or serve with plain rice cake. I normally make a big batch, store some in fridge for up to a week or freeze till ready to use. Hard boiled eggs are great simmering with the sauce to absorb the sauce flavour. 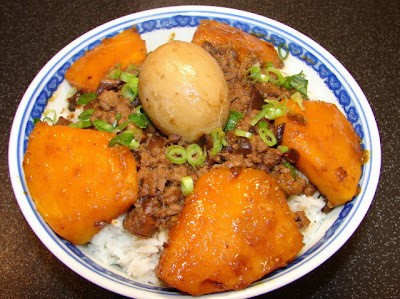 This type of flavoured eggs are called 滷蛋 'lu dan'. Add oil to heated wok, when oil is quite hot add garlic and onion, Stir fry till light golden. Add dried shrimps stir till fragrant. Add pork break into small pieces. Keep stirring till meat juice is drying and meat is almost cooked through. Add wine and ginger. Stir for a little while. Then add mushroom. Stir for a little while. Add soy sauce, dark soy and thick soy or oyster sauce and rock sugar. Add about 3 cups of the diluted mushroom soaking water. Turn the heat high till the liquid is boiling. Lower heat, cover and simmer gently for about 1 hour or longer if you like the meat really tender. Check every 20 min or so, add more water if required. When done the meat sauce is watery rather than thick. * If adding peeled hard boiled eggs, add them around last 20 - 15 minutes cooking time. 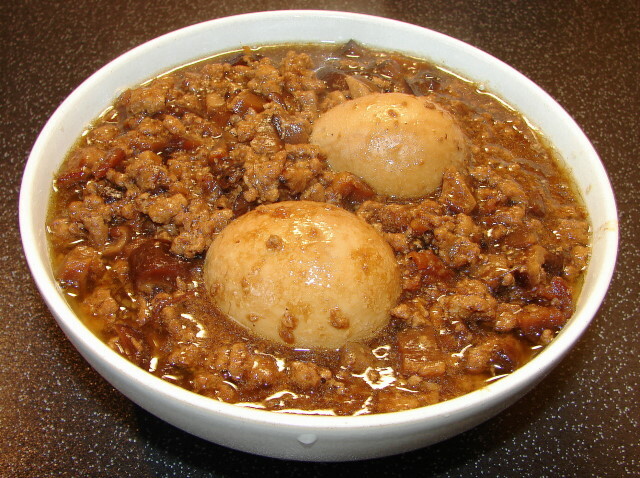 Bury eggs in meat sauce. Cover and leave the pot of sauce (and eggs) aside for 5 - 6 hours or overnight. The eggs will absorb the flavour. The sauce gets better left overnight and becomes thick after cooling. Reheat and use this sauce with anything you like. Keep remaining in fridge or freezer. I just finished making this dish, following exactly as described. Letting it cool down overnight, but I snuck a little taste and it's exactly what I was hoping for. Can't wait to have it over rice for tomorrow's lunch. Thank you!